On a technicality, Wilson was also the first to draw the Traitor General – although he’s in disguise in that story, or rather, he’s not wearing his classic ‘burned-up villain’ face quite yet. One of these men is a Souther Traitor! But the next time we see him, under the pen of Cam Kennedy, his face has been half burned off. Grimaces. Cityscapes. Characters running, jumping and vehicle-stunting into action. Incredibly crisp, sharp and thin lines. Large blank spaces that are also filled with little tiny details. Immaculate production design and costume design. Something about the clean whites and thin lines makes this overpass look both futuristic and run-down. 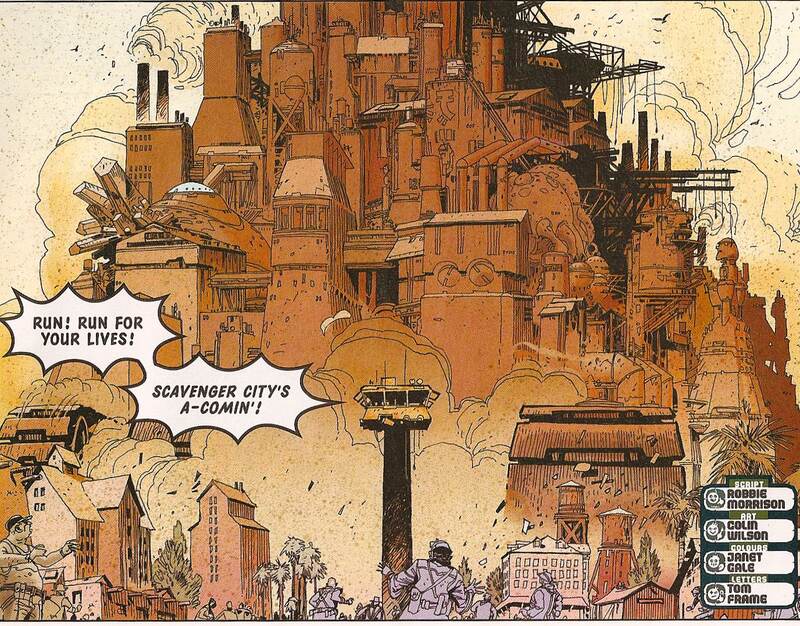 It certainly draws you into the world of Mega City 1. Nu Earth, on the other hand, is all hell all the time, the only relief from poison gas and empty wasteland being the burnt-out husks of military vehicles and bomb shrapnel. Gritted teeth and general grimacing. 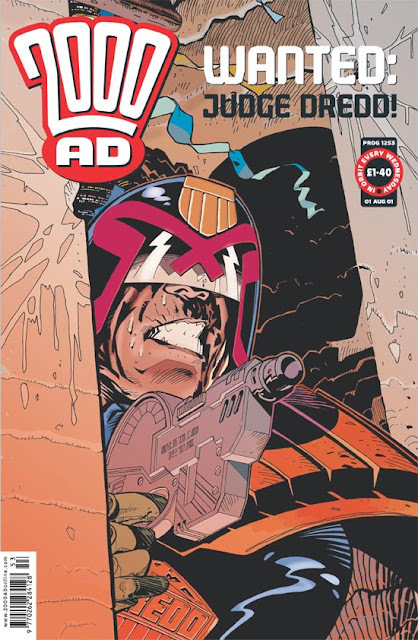 You can practically see Dredd squishing up his face underneath his helmet. 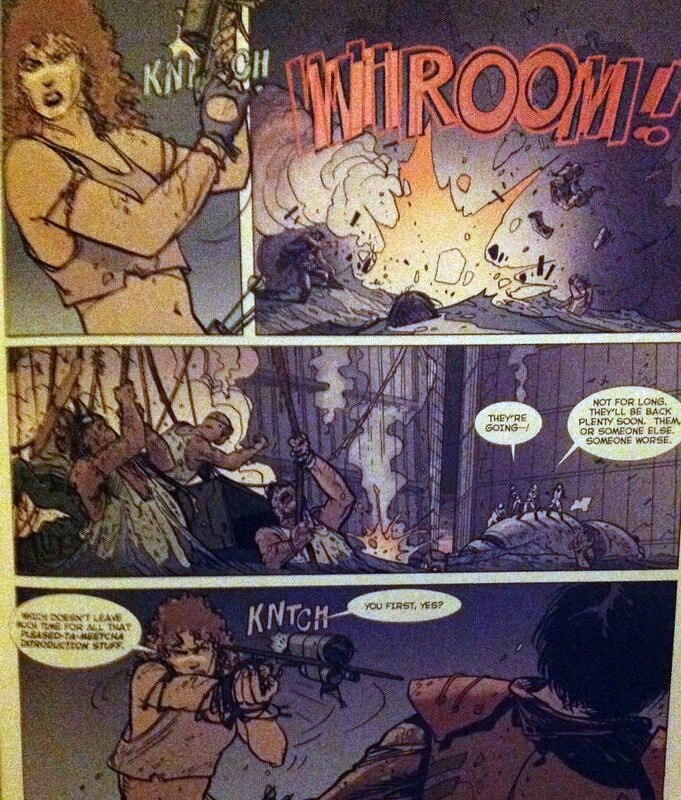 The shininess of Bolland meets the dynamism of Smith - move over, there's a new art droid in town! and then took the baton from Dave Gibbons on Rogue Trooper. Dunno what those robotic pointers do, but I bet it's nasty. Colin Wilson is one of the few who has drawn an honest-to-goodness 'trapped in a virtual reality prison' Future Shocks. ...before moving to the main event, his explosive pencils on Judge Dredd . More beautiful run-down future cityscapes. This one's right out of the Katsuhiro Otomo playbook, but this is like a year before he even started on Akira. SO MANY LITTLE LINES! The look of the man getting soused with acid has a real Euro comics feel to it, if you ask me. Shockingly good, right? 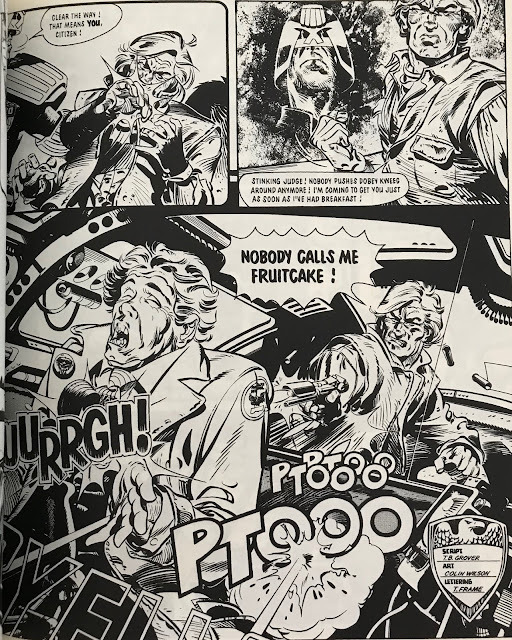 But the main things for me is that it added a layer of urban grit to Mega City One that hadn’t quite been there before, in the whacked-out future look from the really early Ezquerra images, to McMahon’s hyper-stylized architecture. I suppose you could argue that Wilson’s MC1 is almost too close to real city structures from the present day – a little more movie Dredd than comics Dredd. But in the context of the rather old-fashioned Mega Rackets cycle, that actually fit pretty well. Wilson’s people are great too. There’s the down-at-heel look of the man visiting the body sharks, contrasted with the intense craziness of the ‘mad citizen’ who just can’t take it any more. You can just tell all those people haven't been able to buy new coats for ages - but how does Wilson do it? Behold the clenched fist of crazed righteousness! 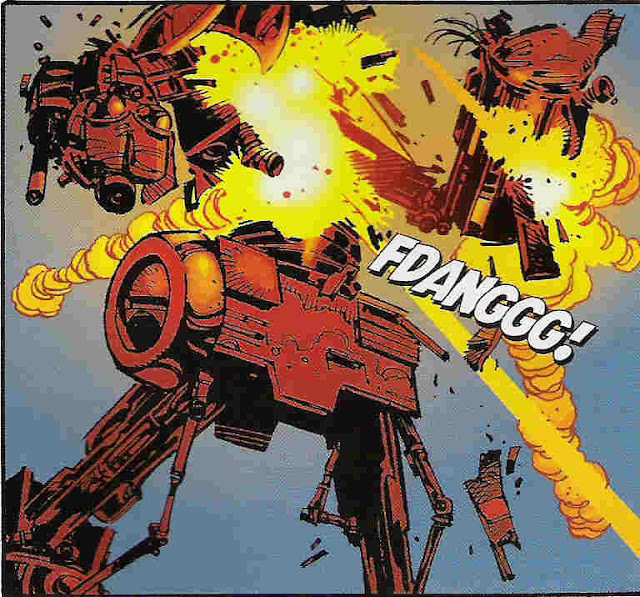 But even more than on Dredd, Rogue Trooper is where Wilson really made his mark. Dave Gibbons did so much to create the world and setting of Rogue Trooper, but most of his stories took place out on the open wild of Nu Earth. Wilson had the chance to put Rogue in different contexts, including military HQs, satellites, and on tour of battlefronts. Dig those shards of shattered glass. Bold use of deep black shadows, wicked. The details on that marauder outfit is exactly why I loved Star Wars figures as a child. It's just cool. Crazy big future war guns! Secret bases with lots of little boxes and lines on them! It's cool! 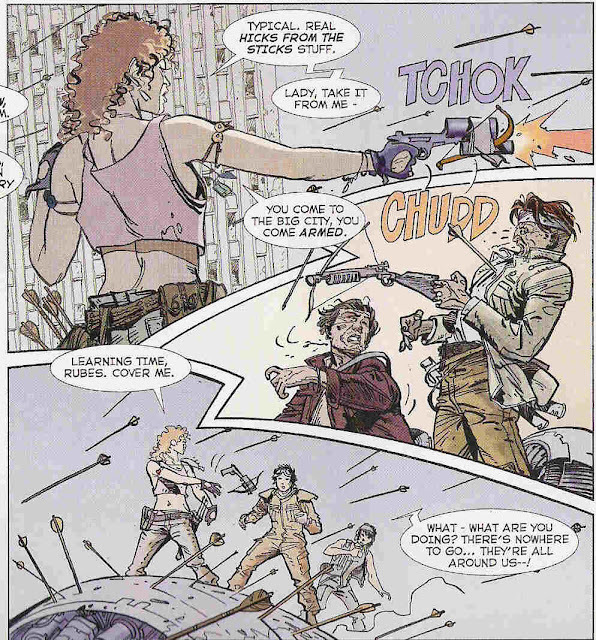 Rogue proved too popular a strip to allow any one artist to do the job, so Wilson rotated with a solid team including cam Kennedy and Mike Dorey, but he felt like the series’ main artist after Gibbons left. Specifically, tackling what you might call the ‘myth-arc’**** of Rogue Trooper, where he almost catches up with the Traitor General (Marauders being the best of that sequence), or the long-form rollercoaster of All Hell on the Dix-1 Front (although he didn’t quite manage all 12 episodes himself), an action romp that feels as if it's telling part of the wider story of the Nort-Souther war, complete with an untrustworthy female lead. Swoopy hair to rival Alan Davis! …if it weren’t for incoming assistant editor Andy Diggle, some 15 or so years later, who set about finding this lost favourite, and putting him to work as much as he could, on Dredd, on one-off delights, on the latest version of Rogue, and even on his own all-new series, Rain Dogs. Also, some Pulp Sci-Fi, back when Tharg was trying that thing of doing Future Shocks that weren’t required to be defined by their twist endings. I suppose the major selling point of the series was to have super SF-y Science Fiction, as in proper futuristic spaceships and such. As someone with a gift for environments and hardware, Colin Wilson was a good fit, although I have to say it struck me that leaning too much on this end of his work revealed that he’s actually much better as selling emotions with his people, even if he uses their environments to help communicate said emotions. doesn't quite have the intensity of classic Wilson. Always fun to see an artist tackle a character they're not normally associated with. Wilson's Nemesis is way more Redondo than O'Neill, for both good and ill. Phase 2 Colin Wilson has to deal with colour, at a time when digital colouring was the way to go, but at a moment in time when it hadn’t quite got really good yet. 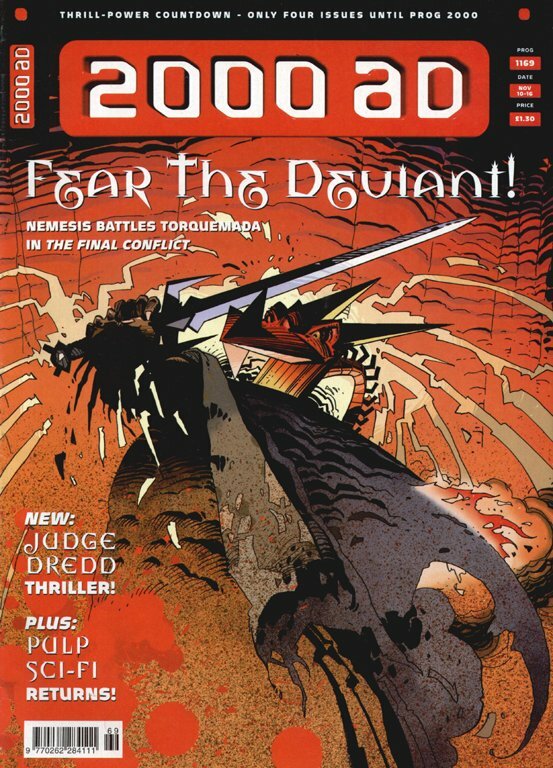 Perhaps as a result of this, Wilson’s return to Judge Dredd didn’t have quite the same impact as those earlier efforts. The grimaces are all present and correct, but the backgrounds don’t have the same lived-in feel. 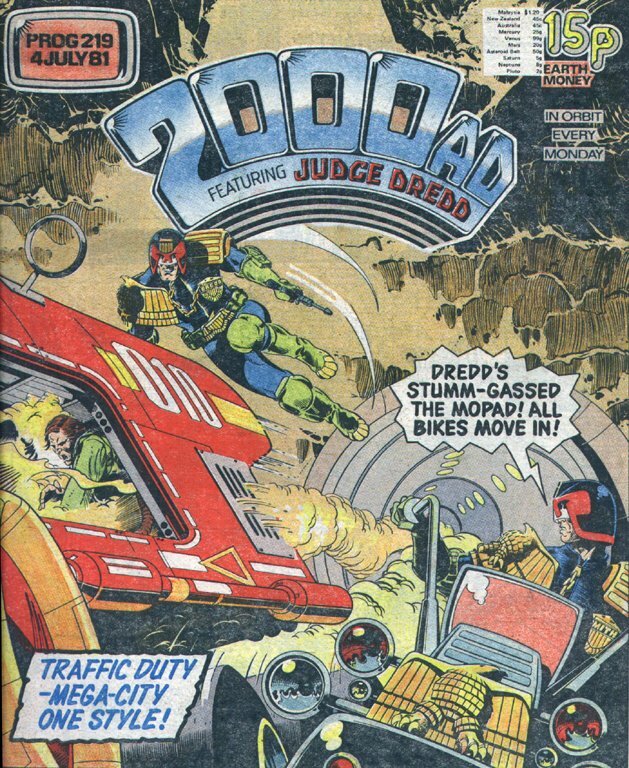 Maybe it’s just that the Mega City One of this era was a shinier place, or that these stories were more about the upmarket ends of town, as opposed to the seedy parts where one might go to find an organ legger. Keep those teeth clenched tightly, Joe! Such an awesome angle to show flying cars chase in a future city. More Manga by way of Euro-comics set design amazingness. 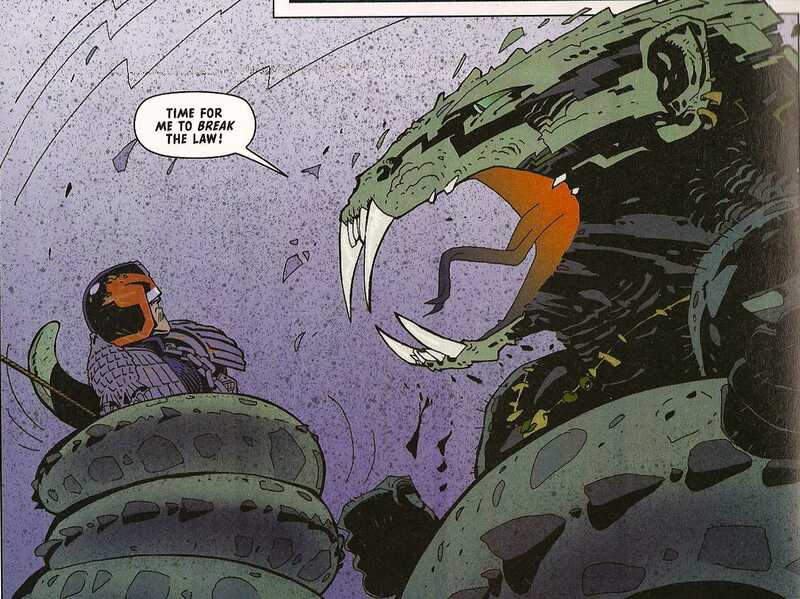 There's fun in Wilson's giant monster design, but it's not quite at the level of his technological stuff. Grizzled men fighting smooth-skinned ladies. but, more importantly, there’s some political machinations involving Volt, Herhsey and the ever unpleasant Jura Edgar. Hershey and Edgar, head to head. More expert use of negative space. 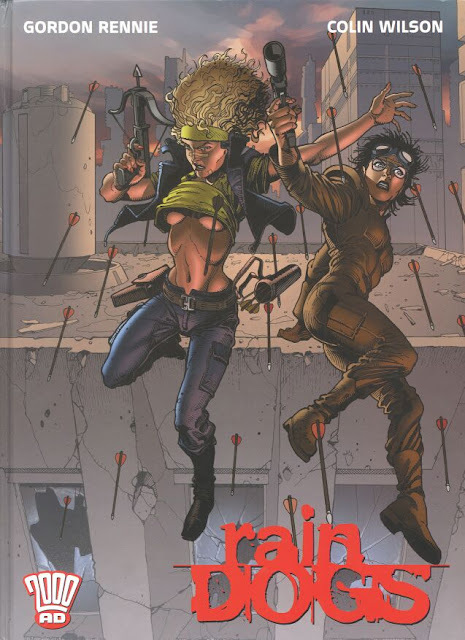 Rain Dogs makes the best of a slightly washed out look, suggesting a world that is faded compared to our own. I really want Rain Dogs to be better than it is, but there’s not quite enough going on. The characters are fine, the setting is excellent, and the art sufficiently moody, but it’s all a little too by the numbers grim action movie stuff, down to the perma-scowls. The sky is pretty key to this post-apocalyptic society. No nonsense meet-cutes in Rain Dogs. Tor Cyan was a definite step up in ‘nu-Wilson’ terms – perhaps he has some strange affinity for war-torn alien planets, and burnt-out super soldiers? Gritted teeth, check. Wrinkled clothing, check. Crazy future gun, check. Washed-out landscape, check. This was some three years after he’d been a regular feature of the Prog and Meg, a little hit of nostalgia called What if Gunnar had survived the Quartz Zone Massacre? 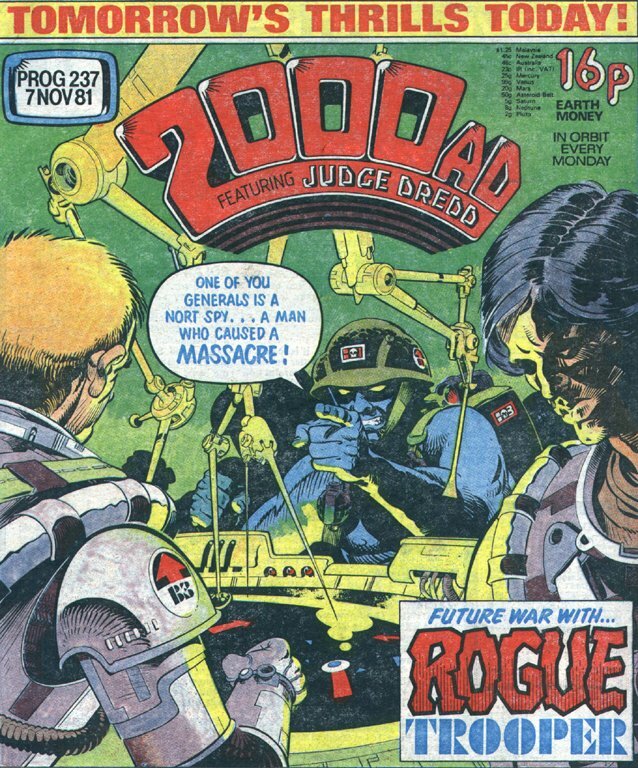 – basically, a one-off showing what early Rogue Trooper strips might’ve been like if the leads character had been a trigger-happy psycho. Wilson plays ball, combining his newer way of drawing faces with his classic black and white super detailed costume work. Gunnar's face - meaner than Rogue. Sadly his own website seems to be down at the moment, but it may go live again one day? *I’ve actually forgotten what the link is between Cyan, Rogue and Friday. But there definitely IS one! **Not on American comics, though, but into the altogether classier field of European albums. ***Of course, Diggle promptly brought Wilson with him to the US when he left to write for Vertigo. See also Jock. ****An X-Files reference for you there, showing my age as a 90s kid. Propaganda wars are the worst!